With the Swell we wanted to make a wave and freeride kite that excels in all conditions, good or bad. The result is more than a wave specific kite with great low end power and great upwind drive. Its well-balanced 3 strut design and responsive handling also makes it an extremely fun freeride option, more than capable to handle kiteloops, big boosts and smooth landings. The Swell´s specially designed shape allows it to be flown at a higher angle of attack (powered up), and gives it superb low end power and an incredible high end range. By using a 3 point cascading bridle with a single low friction ring the Swell offers the best of two worlds; quick turning and a huge depower range. 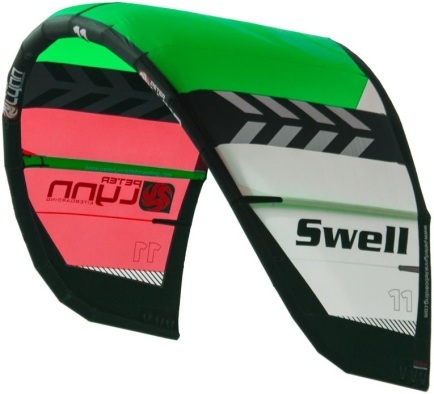 The Swell’s 3-strut design and balanced medium Aspect Ratio results in a very lively and responsive kite. Depowered the kite remains totally stable and responsive to steering input, a must for “down the line” wave slashing. Tested the Peter Lynn Swell on a small waveboard and a hydrofoil. Most wave kites are interesting for hydro foiling. Good feedback, drift and lack of boost or kite lift. The drift of the Peter Lynn Swell V2 is much better than the V1 Swell, the kite reaction is pretty fast. Still I've got the feeling the kite can be tuned a bit better. A bit less backstall, a bit more stable and a smoother turning circle without a stopping moment would finish the Swell V2. We tested the swell in à bit gusty conditions on à inland lake. When I maked a jump or a kiteloop the kite sometimes surprised me with a unexpected boost. I've been using the new Swell (V2) in different conditions in the last month and I've to say I'm very happy with the kite performance. Like the old Swell, I really like the on-off switch of this kite, once you are on a wave you can switch it off and you can concentrate on the wave and the kite gently flows with you. If you need more power, just pull the bar a bit and off you go. It seems that the V2 model has a bit more boost and is more allround then the previous model, without loosing the wave characteristics. The new big inflation valve is easy to use and it makes it much easier and quicker to fill the kite with air. I also liked that they use a new sort of ring on the bridles, the old one could have some wear after using it a lot. The kite is very very stable in the air. Last session was with gusty winds (18-35kn with a 9m) and the kite performed really well. I do a lot of downwinders and the Swell is performing perfectly going downwind. It just glides with you and reacts when you want to. I only had to relaunch the kite once, its easier then making breakfast.. If you're looking for a new (allround) wave kite, then consider this kite and put it on your shortlist for testing. For me, the new Swell works like a charm and truly is a little gem.